Banana firm Chiquita has rejected a takeover bid by Brazil's Cutrale and Safra groups, saying it was sticking to its plan to merge with European fruit seller Fyffes. Chiquita said the offer from Brazil was "inadequate" and that it would not hold talks with the groups "at this time". Fruit juice firm Cutrale and investment bank Safra made a $611m (£363m) bid for US-based Chiquita on Monday. In March Chiquita and Irish fruit group Fyffes agreed to merge. Monday's offer from the Brazilian businesses sent Chiquita shares 31% higher, while Fyffes fell 15%. 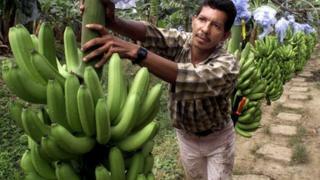 A Chiquita-Fyffes merger would create the world's largest banana supplier, with $4.6bn in annual revenues. The deal would allow Chiquita to avoid higher US taxes by relocating its statutory headquarters to Ireland. This so-called tax inversion has been considered by other US companies, and become highly controversial as it would mean lost government revenues. Chiquita said on Thursday that the Brazil offer was "inadequate and not in the best interests of Chiquita shareholders". "Having made such a determination, Chiquita has determined not to furnish information to, and have discussions and negotiations with, the Cutrale Group and the Safra Group at this time." The two Brazilian companies said on Monday that their offer was "clearly more favourable to the Chiquita shareholders than the proposed merger with Fyffes". The global banana market is currently controlled by four firms, Chiquita, Dole Food Company, Fresh Del Monte and Fyffes, according to the United Nations.